More good luck: Col d'Izoard was closed to cars between 9:00 am and 12:00. Very civilized! 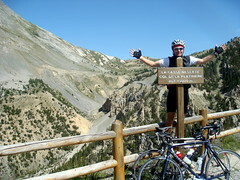 And more good luck: Col d’Izoard was closed to cars between 9:00 am and 12:00. Very civilized! This is a stunningly beautiful climb. On the north side it winds up through the woods. On the south side, is the famous Casse Desserte and it’s unique environment. We stopped for a few photos at the Coppi / Bobet monument. 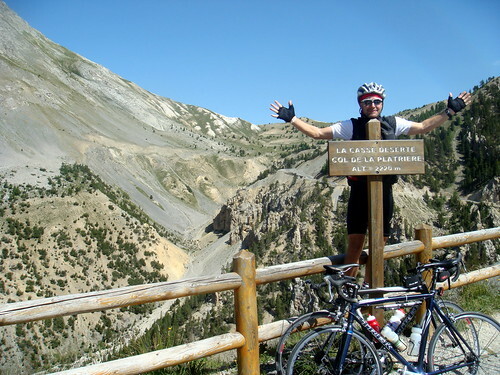 After a great descent through a deep river gorge, the ascent of Col de Vars started in extreme heat. I think we were all a little tired and a long lunch half way up was much appreciated. We passed up the option to visit the nearby epic Col Agnel. The ride was already over 100kms. This is exactly what we experienced on our trip too. Izoard in the morning, followed by Vars in the afternoon means you climb Vars in full sunshine/heat. A true killer-climb that way. Hi to everyone on the trip.